A sociologist with no training in the physical sciences is puzzled why most Americans think the world is not doomed by global warming. So flummoxed is Yale’s Justin Farrell that he decided to study the question in the most scientific way possible. And he managed to publish his results, “Corporate funding and ideological polarization about climate change,” in the prestigious Proceedings of the National Academy of Science. What do you think his conclusions were? Perhaps that thirty years of failed temperature predictions boosted Americans’ skepticism? Or that the obvious eagerness of politicians to leverage exaggerated fears have left many skittish? Or maybe it’s the dearth of severe storms, despite the many promises that floods and droughts would drown and parch us all? No, none of that. Farrell discovered that private groups spent their own money to say that things were not as bad as alarmists claimed. He told TheWashington Post that these “contrarian efforts have been so effective for the fact that they have made it difficult for ordinary Americans to even know who to trust.” Indeed, I, myself a climate scientist, no longer trust anything non-scientists like Farrell tell me about global warming (which he incorrectly calls “climate change”). Farrell is right about one thing: Global warming alarmism is big business. On one side you have Greenpeace, the Sierra Club, The Nature Conservancy, World Wildlife Fund, Environmental Defense Fund, The Climate Project and dozens upon dozens of other non-governmental organizations who solicit hundreds of millions from private donors and from government, and who in turn award lucrative grants to further their agenda. You also have the Environmental Protection Agency, the National Science Foundation, the National Institute of Health, the Departments of Commerce and Agriculture, both Houses of Congress and many more government agencies, spraying global warming money at anything that moves and at staggering rates — billions of dollars. And then you also have every major and minor university — with contributions from every department, from Critical Literature Theory to Women’s Studies — all with their hands out and eager to provide the support Greenpeace, the government and others desire. Add to that another two or three dozen think tanks which are also sniffing for grants or which support government intervention to do the impossible and stop the earth’s climate from changing. Every scientific organization which is dependent on grant money has released a statement saying “something must be done” about global warming. They’re supported, fawned over and feted by just about every news and media agency. And don’t forget the leadership of most major organized religions have their own statements — and their hands out. We’re not done: we still have to add the dozens of Solyndra-type companies eager to sell the government products, to get “green” subsidies or to support its global-warming agenda. Included in that list are oil companies. Oil companies? Yes. Oil giants aren’t foolish. They want to benefit — and also don’t want to suffer from — the mania that surrounds all things climate change. Their activities are often mercenary: Oil companies will and do fund research that casts a bad light on coal, its main competitor, in hopes of lessening competition but also in expectation of securing peace with activist groups. Shell Oil since 1999 handed out $8.5 million in environmental grants. Like ExxonMobil, many grants flowed to the National Fish and Wildlife Foundation, but $1.2 million went to the Nature Conservancy; the remainder was spread to several different environmentally-minded groups. 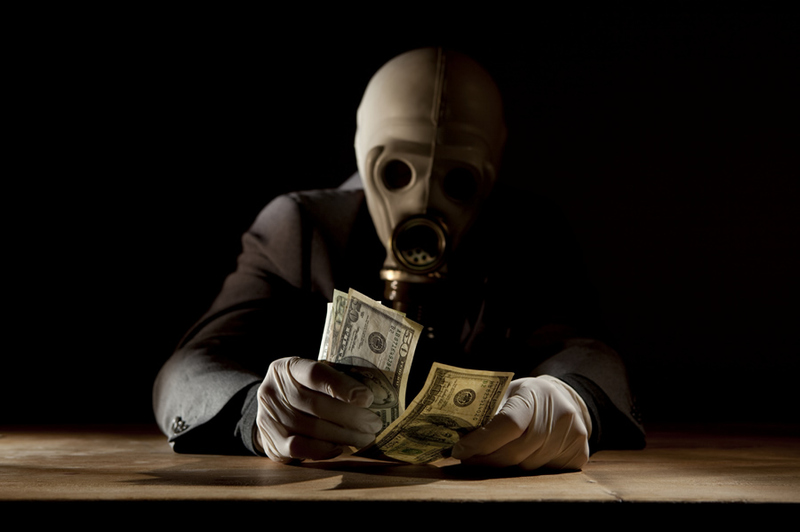 Joanne Nova has documented the massive amount of money pouring from government into the pockets of individuals and groups associated with the environment. “The U.S. government has provided over $79 billion since 1989 on policies related to climate change, including science and technology research, foreign aid, and tax breaks.” $79 billion. And Farrell, our stalwart sociologist, nabbed $126,000 from the EPA between 2012 and 2014, and another $18,500 from the National Science Foundation to study the environment and society. Doubtless he will be similarly rewarded in the future. Funny he never mentioned his funding, nor the funding of all those pushing scenarios of the world’s end. All that is on one side. And on the other? Well, there’s a handful of privately funded think tanks, a smattering of generous individuals and businesses, a journalist here and there, and (ahem) a few skeptical scientists scratching what living they can, all trying vainly to tell the world that the sky isn’t falling and that government intervention isn’t needed. In the interest of full disclosure, the total amount of any consideration I have ever received from any oil company, or any oil company affiliate, is, rounded to the nearest dollar, $0. But it was in cash. Skepticism of environmental apocalypse does not pay. So in conclusion, the fix is in? Climate legislation is a foregone conclusion, and not a matter of if it will come to pass, but rather, when it will come to pass? Perhaps the greatest illusion of all time, first create a potential catastrophe based upon unprovable, yet plausible theory. Next fund anyone and everyone willing to support this theory. Lastly create legislation to avert the impending make believe catastrophe, thus guaranteeing success. All while lining the pockets of all involved. The train is moving faster every day , no stopping it now. The most heartening thing about it is the fight over money may just derail the whole UN money grab at least. Lots of nations insisting on the “100 billion a year” (as a starting point) are probably pushing too hard. I hope they choke on their own greedy appetites. Maybe you’re right and it will implode under it’s own force. One can only hope. Every issue on the planet has eventually been about who could profit from it. This is just one more. I have more extensive comments at my blog, primarily because comments end up becoming long enough to be posts. But briefly, in the 1960’s, a group that wants to rule the world made a report called the “Report from Iron Mountain”, in which they discussed the best way to control the nations. What was needed was a common enemy. They decided the environment would be a suitable enemy (around which they would rally the masses to fight, and of course “their” leadership was required for this fight) and thus the environmental movement was born. It is not about so-called global warming, it is ultimately about global governance by an elite group that wants to destroy national sovereignty and reduce the population (for the good of the earth). AGW is now clearly defined as Al Gore’s Wrong!!! PS go plant a tree!!! Yes it is all a socialist scam! (it is all about control and has NOTHING to do with climate!!!) Wake up people!!! Don’t be a Natural Climate Change denier. Yes, tax us on our SUCCESS, not the very air that we breathe!!! If anyone was TRULY were here for the environment rather than the socialist tax, they would rationalize that with it’s Forests and Vegetation, Canada absorbs MORE CO2 and converts it to Oxygen, that’s right, MORE CO2 than all it’s industries produce! In fact we are at the very least, Carbon Neutral!!! Can the sandy Middle East say that? If CO2 is the Demon they are saying it is (but it isn’t!) then we should produce ALL fossil Fuels in Canada? Can you imagine that rather than Trudeau giving $$$Millions to the Middle East Country where his Brother lives, he actually used the above logic, realized that Canada is an ABSORBER of CO2, planted a tree and invested-in and supported the Strength of his very own Country that he was elected to benefit and help succeed!!!??? As a meteorologist I study weather and climate patterns and have found that the short term data ( last 150 years ) can be used by the alarmist to show global temp rises and sea level rises, however using long term data ( last million years ) shows that short term data is very misleading. The long term data shows lower co2 levels than in the past and the trend of sea level rise is actually slowing in the last 8,000 compared to the previous 12,000 years. Global temps and sea levels have risen and fallen dramatically in the last 450 million years and we are in much better shape than in many periods of the past. Don’t forget that they are reversing correlation and causation, whereby they observe CO2-levels rising with temperatures, and say that the former caused the latter– despite happening AFTER. One element I never see, is “geothermal tides,” whereby the positions of the sun and moon have varying impacts on subterranean heat-flows, and disparate impacts regarding their timing and synchronization. That could easily cycle a slight change in temperature, as well as explain geographic variances; but while everyone accepts marine-tides, few attend to this impact on the Earth’s core– despite that 31% of the Earth’s mass is liquid magma. This proves they are dishonest and irrational, since it’s a CONFLICT OF INTEREST. NO. Conflict of interest is NOT about proving bribes, it’s about STRICT LIABILITY. Judges cannot accept gifts from parties FOR THAT REASON; and for the same reason scientists cannot opine on matters involving their funding– NO MATTER WHAT. But AGW scientists deny that money plays ANY part– but not that they RECEIVE it. They are the world’s biggest liars and hypocrites.